I like this quote because it pretty much describes what I went through the last few mornings. Last week, I decided – for some odd reason- to host a ‘mellow’ fourth of July gathering at my house. I had to keep it mellow because I had to work the 5th of July. *Quick sales tip: For some reason I have the best luck cold calling CEOs, CFOs, etc the day after 4th of July! It works every single year. You should try it out if you are in sales/your own business. See, it shouldn’t be that big of a deal except I completely turn into a stress case as a hostess. In the past, I had boyfriends who I could delegate tasks to and they would own it. But I am single this year and therefore delegating most tasks to myself. I was lucky to have a right-hand gal with me come party time- Lolo. Thanks, Lolo. Before I could even begin the planning, the menus, the shopping for this thing- I had to clean up the backyard. The dogs had been pooping and peeing back there all winter/spring, so had to clear that out. Next came the matter of my ‘lawn’. I had planted sod back there over three years ago, and with teacher training and traveling- hadn’t been doing the best job at keeping it alive. I like having the patch of grass back there for the pups, plus it is nice to see some green in a city that doesn’t offer much of it. The key to keeping grass alive is to keep it watered and my 1924 rented bungalow does not have a sprinkler system. So Momma’s in charge of watering that bi%^&. And it just didn’t happen the last 6 months. I originally called my landscaper and he had quoted me $500 for the job- and I thought, “no way! I could do it for far less and get a workout in there too.” How much to redo my lawn? $500. Five hundy???!!! This DYI-er did not like the sounds of that. That is 1/5 my ticket to Sydney. A round-trip ticket to Seattle. Some much needed shoes and maybe a handbag thrown in there too. No. I know Home Depot sells sod for $2 a piece. I was going to do this myself. Here are the steps to redoing your lawn. 1. Clear the area. Make sure to remove all dead grass, weeds, etc. and get it all out. It took me two hours or so to clear all the dead grass out. 2. Rake the shiz outta your spot. Make sure the soil/sand is nice and loose. Rake as much as you can. For sticky spots, use a shovel to get in there and mix it up. Loose soil allows the grass roots to form. 3. Go get the sod. I put this in here as a step because this is a major part of it. I went to Home Depot three times- they get a delivery at around 630am, and it is first come first serve, so you have to be prepared to jump in there. The first go round, I got eighteen pieces from one Home Depot. That was all my Prius could carry. Second morning I went, they were completely out by 645am. So I went to another Home Depot and grabbed twenty more. 4. Layer the soil with a turf builder product– lawn soil. This will help with the initial stages of the lawn. 5. Lay the pieces like a hardwood floor– almost ‘click’ the pieces side to side, top and bottom. I created a checkerboard pattern here because it was obvious one shipment of sod was higher quality than the other. 6. Water, water, water. Water the crap out of it early in the AM everyday for 5 days straight if you can, then every other day in the summer for about 30 mins. Grass/lawn is not a good drought resistant plant, but my lawn is fairly small and there is nothing like the feeling of grass between your toes. So I did this on my own and I am 5’5″ with brown eyes, smile like the sunrise (lol). Seriously, I weigh 115 lbs and was sweating my skin off, but I ended up only spending less than $100 for this project and got my heart rate up a little. 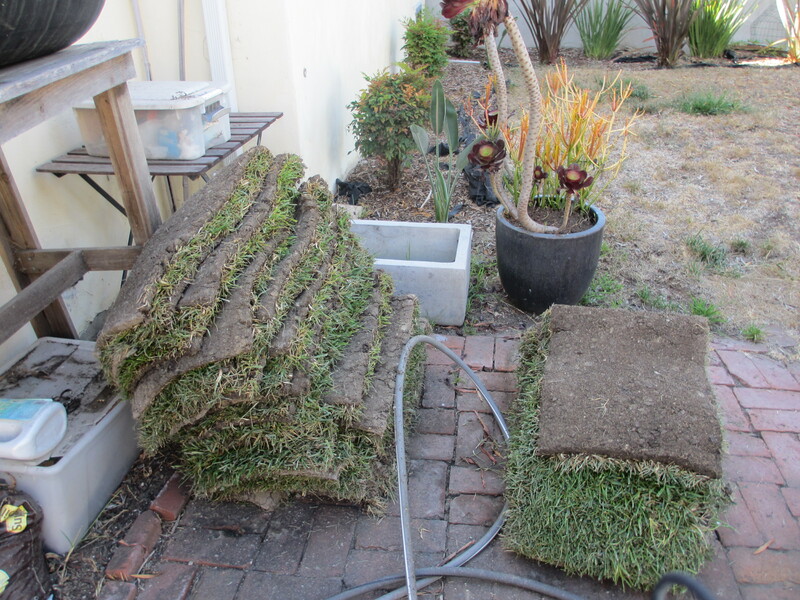 I transported all those heavy sod pieces on my own and placed them- I was determined to get it done before the fourth- and was successful. I think the quote above can apply to any of your own goals and ideas- just get clear about what it is you want to do- and guess what- despite the dirt and sweat and labor- just do it, you’ll be happy you did.